You must have seen naga linga tree in the lord shiva temple near you. In your region it must called in different name. Naga Linga is considered to be loved by lord Shiva that is why in most of the lord shiva temple you will see Shiva Linga tree. 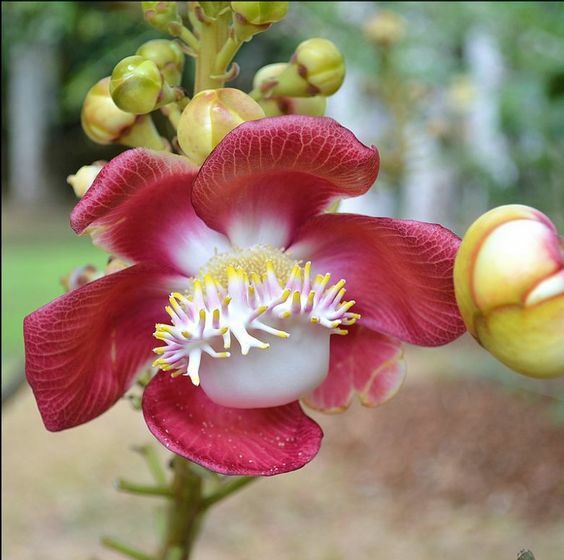 Naga Linga is know as Couroupita guianensis in scientific name. It is generally called Shiva Linga tree in india.These are the regional name of Naga Linga Nagalingam in Tamil, Nagalinga Pushpa in Kannada, Nagamalli or Mallikarjunaflowers in Telugu. Naga Linga is called cannonball tree, it gets its name because of the shape of the fruit it has like cannonball.Cannonball tree fruit is large in size and spherical in shape. When the fruits get ripened and fall on earth, they burst open with this loud crack and a smell comes off. This attracts animals and insects to come and eat it. Then they spread the seeds through their dung. Shiva Linga or kailashpati can grow unto 35 meter tall. These Shiva Linga. Th Trunk looks covered in flowers. Amazingly one tree can bear up to 1000 flowers per day! The flowers have a strong scent, and it increases at night or in the early morning. The Shiva linga flowers are comparatively larger and can grow up to 6 cm in width. Those are brightly colored with the six petals. In the flowers, you can see shades of pink, red and yellow. As we know fruits are used to spread seeds of the tree shiva naga is also do this by having 60 seeds in the cannonball fruit. Some fruits can have unto 150 seeds in the fruits. Do you know Naga Linga tree can hold 150 fruits at time. it can take up to one year to grow fruits.